Sylpheed 3.7.0 Portable » TopFreeSoft.Net - Best Freeware Software! 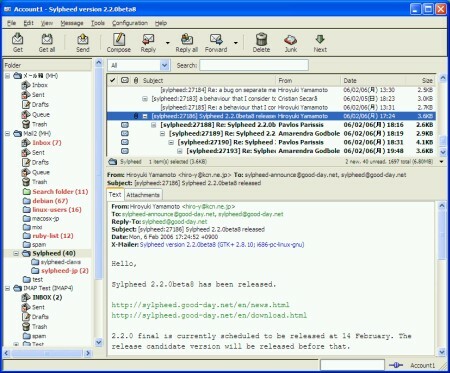 Sylpheed adopts 3-paned display similar to the popular e-mail clients for Windows such as Outlook Express and Becky. So it is easier to use it on the first time. The user-interface is constantly improved, and Sylpheed achieves attentive, comfortable operationality. Especially the operationality of keyboard is taken count of, so you can sequentially read mails efficiently. Of course, you can use easy mouse-only operation. You can also customize the behavior of mail display in detail.